Welcome to the latest Stopwatch Gardener podcast, where I take a sunny February walk around the garden. If you use iTunes, there’s a link to subscribe at the bottom of this blog, or you can sign up in the margin here to get an e-mail alert whenever I publish a new episode. As you may or may not know, I went to Amsterdam recently for the tulips, and stayed for the volcano. Stupid geothermal activity. The delay has thrown my work schedule completely, keeping me away from the blog for some time. But I had to post something this evening because, looking over my pictures from the trip and especially the visit to Keukenhof (a huge spring garden in Lisse, in the midst of the bulb fields south of Amsterdam, open until this Sunday), I’m stunned again at the growing conditions of tulips in Holland. As the proud Dutch will tell you, God made the world but the Dutch made Holland, systematically draining tracts of land (which they call polders) for agriculture, and keeping the land drained with their network of dikes. This is reclaimed, thoroughly sandy soil: passing some builders digging up a sidewalk, I marveled at the spoil they’d dug out, exactly like children’s play sand. 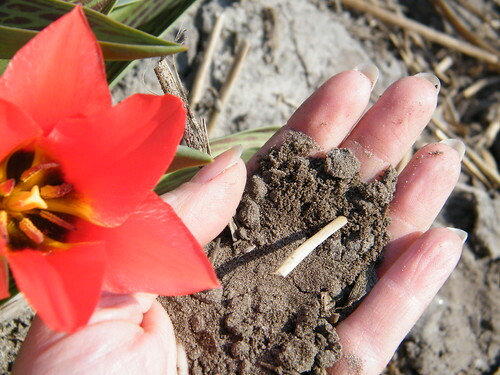 I’d always heard that tulips should sit on a little nest of sand at the bottom of the planting hole, but truthfully they’re happy in a very sandy environment, a realisation which will definitely inform where and how I plant this autumn. It was a cold spring in Holland, just as in Scotland, and only some of the large single early tulips were out, along with miles of hyacinths. Keukenhof isn’t to be missed if you get over to the Netherlands in spring; growers each take a section of land around the lightly wooded lawns of the garden, planting their own displays with thousands of bulbs each autumn. The mature trees are just coming into leaf as the flowers emerge below, creating that dappled sunlight effect that, along with the occasional babbling stream and the dreamy scent of narcissisus and hyacinth, deliver a pretty good approximation of my mother’s idea of heaven. I don’t know about you, but every October I develop such a strong bulb lust that all memory of the sad, fading foliage of tulips in June disappears, and I can think only of those goblets of colour lit up like Tiffany lamps. 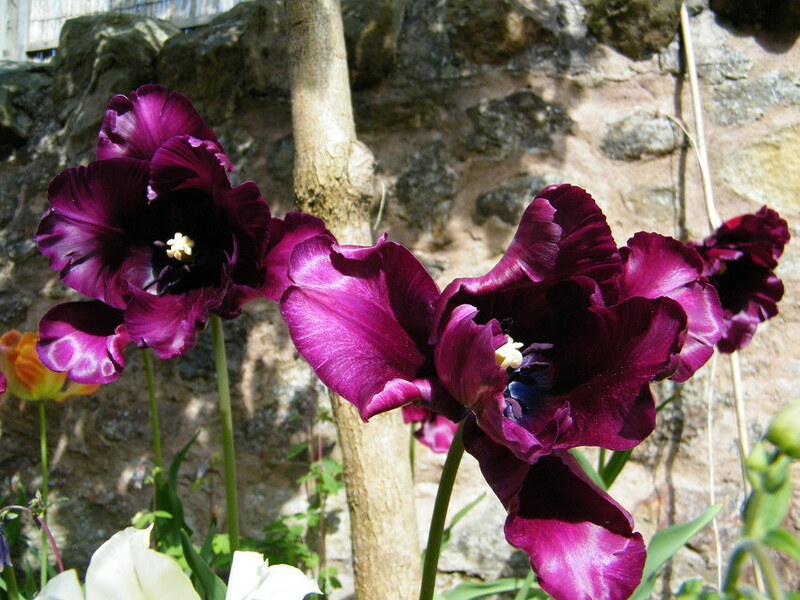 This year, I’m thoroughly smug at how well a new combination has turned out: I’ve added the single purple “Passionale” tulip alongisde the wavy orange wonderfulness of the parrot tulip, Prof. Rontgen. Those reliable folk at Rose Cottage Plants recommended (and who was I to resist, browsing their offers during the depth of That Winter) a parrot called Muriel, a sumptuous purple thing which is supposed to marry my Passionale with the Professor. Muriel is just about to make her appearance — I’ll let you know how she fares. Oh, and those tulips I planted in a row beneath my window? Fabulous. They give exactly the 17th century colours I was looking for, although after seeing at Hortus Bulborum (a bulb “zoo” outside Amsterdam which keeps the greats alive) the wee Duc van Tol tulips that fueled tulipmania way back when, I think my soaring, 24 inch high Mickey Mouse single early tulips have much more majesty. At Keukenhof, planted in the ground under cover were a selection of tulips from each grower, and many of these were almost over when we saw them, but enough were in good shape to give me that October feeling. 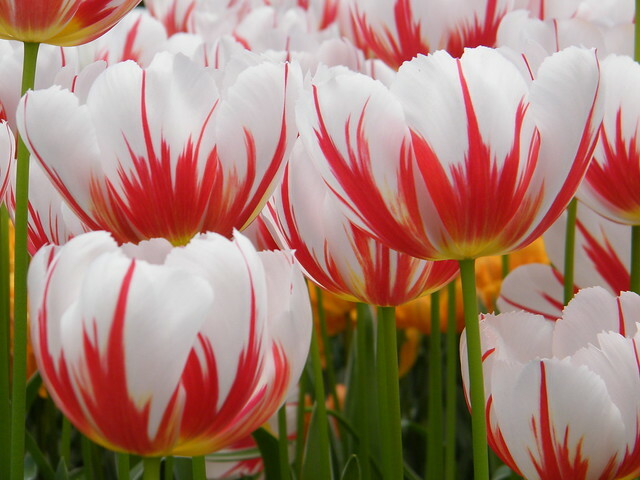 The perfection of “Happy Generation”, a red-on-white striped Triumph tulip, far outdoes the fluffy “Carnival de Nice” which I’d had my eye on. Red and white will fit fine into some parts of my spring colour scheme…just. But really I need a bigger garden. Would you like to see the videos I took inside the Keukenhof tulip tents? I’m in the process of publishing them here on the Stopwatch Gardener channel on YouTube. Do you get bulb lust? How have yours performed this strange spring? Massive snow melt and rising rivers have come with the big thaw, now that our deep snowfall has turned liquid. Watching our local river rise 5 feet, it made me think about how snow locks up water the way trees lock up carbon dioxide. Gardening hard, as I’ve done the last few seasons, has done this to me — make me watch every aspect of the changing seasons and think about what it might mean for my garden. My poor, pummelled garden, now free of that heavy snow but looking squashed, like a flower flattened between the pages of an encyclopedia. Which is why I felt my mouth fall open today when I saw a single snowdrop — Galanthus elwesii — white and perfect and definitely alive. I took a walk around and checked on the other signs of life which have been thrilling me out of all proportion to their size. A tuft of striped crocus leaves, 2 inches high? A few battered narcissus leaves breaking through the soil? I’ll take it — it’s January, and my standards and expectations for the garden are at their lowest. The desk where I write gets sun for two hours in summer, and much less in winter when the sun can’t be bothered to rise very high. This time last year I wrote this poem during one of the sun’s rare appearances at my desk. Do you ever get poetic about your garden? If so, I’d love to hear some.